government by bishops (from the Greek “episcopoi” meaning “bishops”). The historic episcopate continues the work of the first apostles in the Church, guarding the faith, unity and discipline of the Church, and ordaining women and men to continue Christ’s ministry. Pictured at left is the Most Rev. Michael Bruce Curry, previously Bishop of North Carolina, who is the 27th Presiding Bishop of the Episcopal Church. He is chief pastor to the Episcopal Church's 2.4 million members in 16 countries and 110 dioceses, ecumenical officer, and primate, joining leaders of the other 38 Anglican Provinces in consultation for global good and reconciliation. Bishop Curry was elected at the 78th General Convention on June 27, 2015, and installed at Washington National Cathedral on November 1, 2015. ​For further exploration of the teaching of the Episcopal Church can be found in the Church's Catechism: (http://www.bcponline.org, click on "The Catechism"). Here the teachings and beliefs of the Episcopal Church are articulated in this "Outline of the Faith." It is designed in a question and answer format. 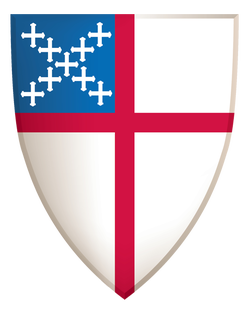 The founding fathers of the Episcopal Church were also the founding fathers of our country, and the shield's red, white, and blue colors and layout are similar to that of the American flag. Red represents the blood Christ shed for us; white symbolizes purity, and blue is the traditional color of the Virgin Mary. When no Anglican bishop would ordain a bishop for the new church in America, bishops of the Church of Scotland agreed to lay hands on Samuel Seabury, ordaining him the first bishop of the Episcopal Church. This cross honors the role that the Church of Scotland played in the birth of our church. Ask the Bishop: Send a question to Bishop Bob Fitzpatrick. Please include at least your first name and city.